It sounds like a film by Mel Brooks: Swan Lake – Men in Tutus. 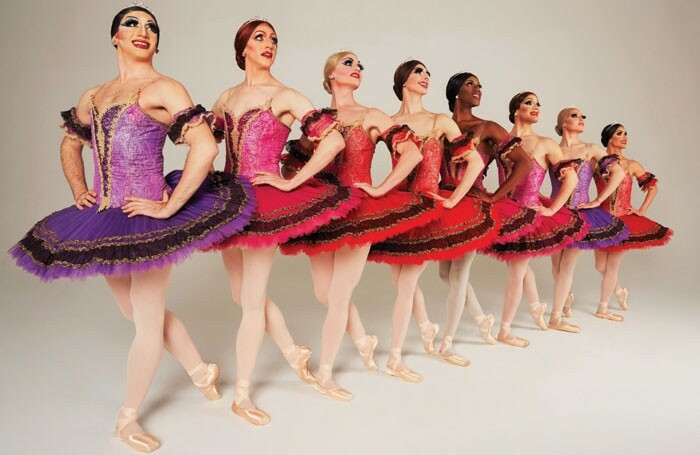 Les Ballets Trockadero de Monte Carlo is an all-male company of ballerinas dressed in tutus and pointe shoes with outrageous make-up. Yet what might once have been written up – or written off – as a novelty drag act has survived 41 years of performing. The Trocks, as they are affectionately known, are still trockin’ when many other independent dance companies have had to turn off the music. Age cannot wither them, nor custom stale their infinite variety. Founded in New York in 1974 as a gay parody/tribute to classical ballet, Les Ballets Trockadero de Monte Carlo performed at midnight in a West Village loft on 14th Street that housed the West Side Discussion Group, one of the first gay discussion groups in New York City. The man running this loft, former architect Eugene McDougle, loved the show so much he became the general manager and propelled it into a professional arena. 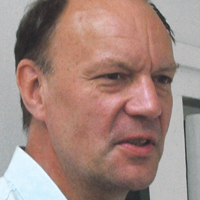 He remained general director until his death last year although he had been semi-retired for about 10 years due to ill health. Since those early days they have evolved from an underground pastiche to a full-blown come-all-ye entertainment of international repute. They are the flipside of the coin featuring Ginger Rogers who could do everything Fred Astaire did, “backwards and in high heels”. The trick of the Trocks is not just that they are men en travesti but that they can actually dance like women. Such is their command of the dance that they never fail to make an impact. Their brutal touring schedule takes them around the world for 40 weeks of the year. 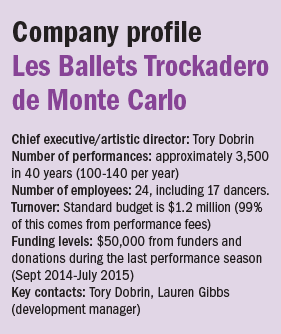 Yet, says Tory Dobrin, current artistic director who joined the Trocks as a dancer in 1980, the internal structure has changed very little. Aside from government-mandated insurance and a storage unit for the costumes, costs are kept to a minimum. Although he is currently seeking long-term support funding, it is a struggle, especially in post-recession US, and virtually their entire budget comes from performance fees. It is the box office alone that determines boom or bust. The years between 1986 and 1990 were close to bust. This was the era of Aids and the largely (though not exclusively) gay members of the Trocks were as affected as any other gay community. There was collateral damage, too, in that the US government stopped funding any companies or projects with a gay sensibility. Although the Trocks did not receive any direct funding, says Dobrin, the theatres did and the fallout was that their bookings for gay-oriented acts declined for fear of losing their subsidies. Thus liberated, it pursued the seemingly divergent aims of parodying Russian classical ballet (company members include Ida Nevasayneva, Sonia Leftova and Yakatarina Verbosovich) while performing with serious artistry. It is this delicate balance between pratfalls and camp humour and breathtaking technique that keeps the company – and the audience – on its toes. For all the laughter they invoke, the Trocks can sometimes hush an auditorium into silence as they stop fooling around and perform a sequence with a precision that would not disgrace the stage of an international opera house. 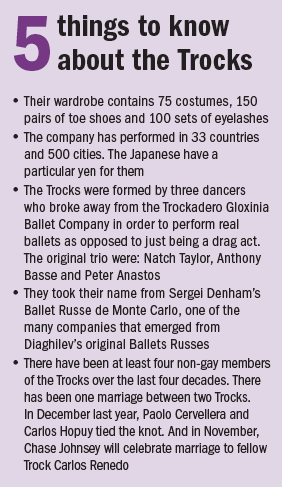 In spite of the fact that the Trocks emerged from New York’s gay community, there have been straight dancers in the company. What is far more important is the commitment to the group and the ability to dance. The physical demands are extraordinary both on stage and off – and the touring schedule is brutal. As a general rule, Dobrin tries to maintain a two-week rest period after a tour and two months off each year – this year August and December. Apart from that they are on the road or in the air all year round. The troupe is particularly fond of touring the UK, says Dobrin, because “Heather Knight of the UK Dance Consortium is the best of the best in terms of organising tours that are manageable and human in dimension”. I had read in an earlier article that apart from their costumes they take their own sprung floor with them in case the theatre does not have one installed. An unsprung floor is very hard to dance on in pointe shoes.